It seems as though dads were practically put on this earth to embarrass their kids, which Ben Affleck seems to be well aware of. The father-of-three put on a silly display to entertain his children while out for a family lunch in Los Angeles on Saturday. 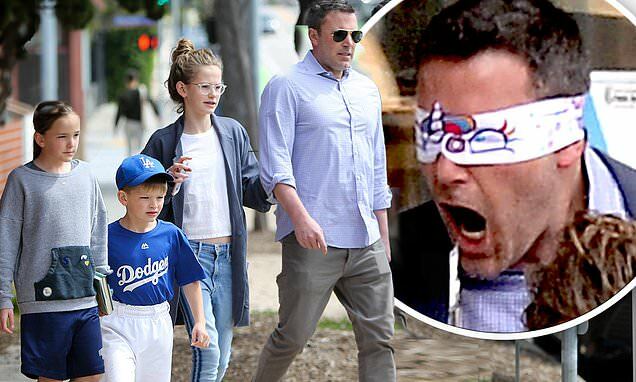 Holding a unicorn headband up to his eyes, Affleck, 46, got animated while Violet, 13, Seraphina, 10, and Samuel, seven, laughed at his goofy antics. Later they all took Samuel to his baseball practice. Ben was spotted sitting down with his little ones on the outdoor patio of a restaurant on the sidewalks of L.A. He sipped on a Coca-Cola as he did his best to put on a show to amuse his two daughters and one son, whom he shares with ex-wife, Jennifer Garner, 46. The actor held a unicorn headband over his eyes looking like a character as the kids doubled over in laughter. As they giggled the day away, Garner treated herself to some 'me time,' while Ben fed the family before heading to Samuel's team photo session. With a Sephora bag on the table, perhaps as a gift to mom, the girls watched their dad closely while sitting in large, white chairs. Prepped and ready to throw a few pitches, Samuel donned a super cute mini sized Dodgers jersey and white baseball pants with dirt marks already on the knees.